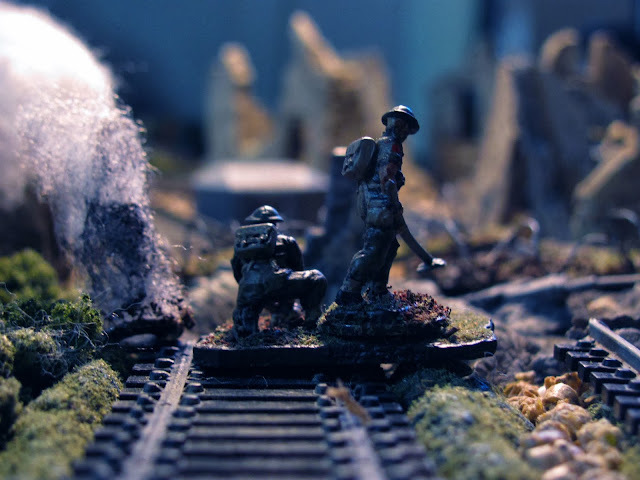 Being a chronicle of play with toy soldiers in an orderly manner. If you want to see the pictures larger, just double click on them. This was a playtesting of a small scenario I wrote for the Battlefont WWII rule set, a tense little night time battle between the Maoris of 28 Battlaion, 2nd New Zealand Division and the German defenders, 361 Panzer Grenadiers of 90th PG Division. 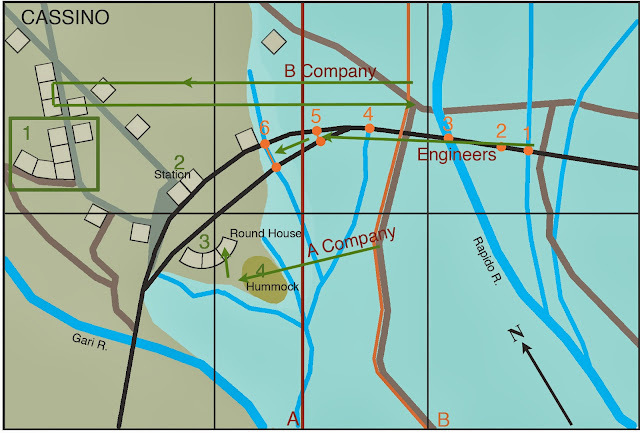 In effect there are two fights going on, one to secure the bridgehead and the other, by the Kiwi engineers, to repair a series of German demolitions along a railway bed before dawn. It was played using 20mm miniatures on a 3' X 4.5' table. Only the first part of the scenario was played as it ended in a German victory, which precluded the second part. By mid-February, 1944 the U.S. 34th Division's attempts to force a breakthrough at Cassino had exhausted the division with only marginal gains in the hills west of the town. The front was now handed over to General Freyburg and his New Zealand Corps (8th Army, 2nd New Zealand Division and the 4th Indian Infantry Division) newly arrived from the Adriatic front. 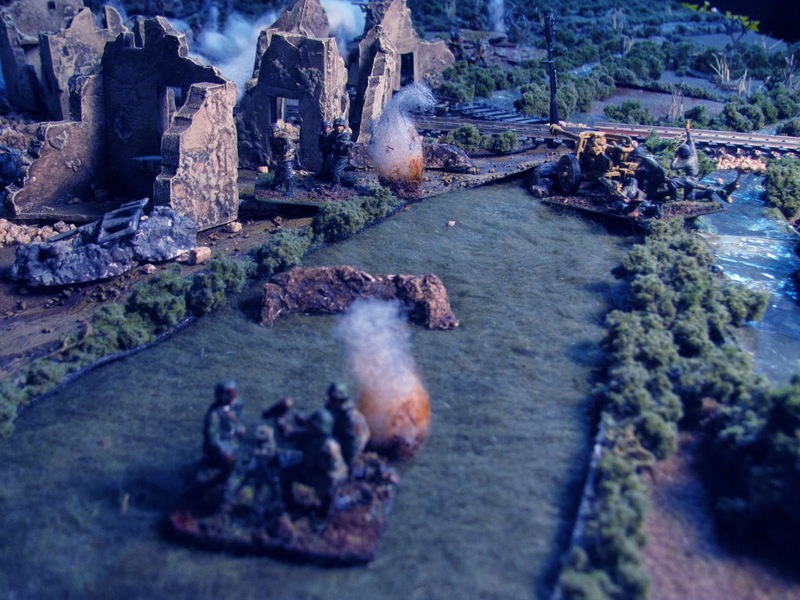 Freyburg was under pressure to launch a relieving action that would divert German resources from the mounting difficulties being experienced at the Anzio bridgehead to the north. A few days before the attack the great abbey at Monte Cassino was reduced to rubble in the still highly controversial bombing of Monastery Hill. 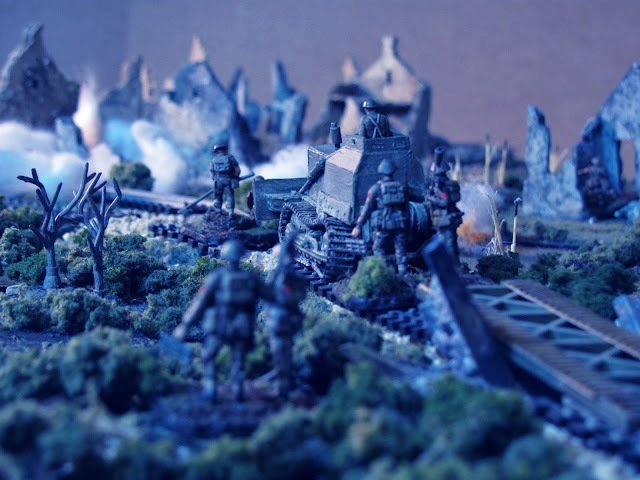 Over the previous months of fighting the monastery and its commanding position over the entire Liri Valley had become fixed in the Allied mind as being primarily responsible for their inability to break the German's Gustav Line. The abbey bombing on February 11 was followed by a series of attacks, culminating on the night of the 17th when the 4th Indian Division launched its attacks into the mountains east of the monastery. 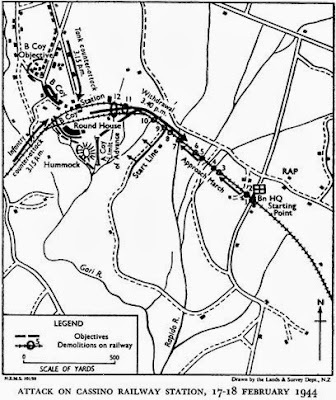 These attacks were coordinated by an attempt by the 28th (Maori) Battalion to force a bridgehead over the Rapido River and seize the Cassino railway station and surrounding objectives west of the town. 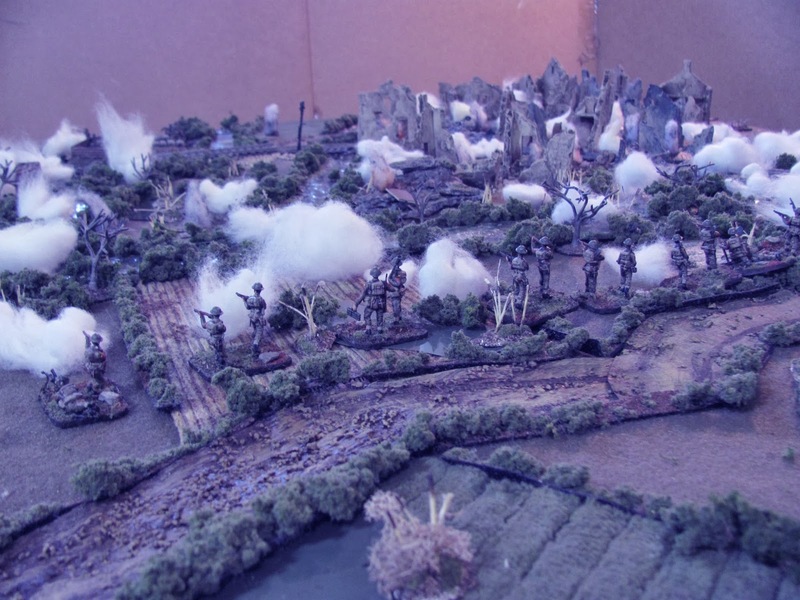 The scenario map shows the two company attack by the Maoris of 28 Battalion. 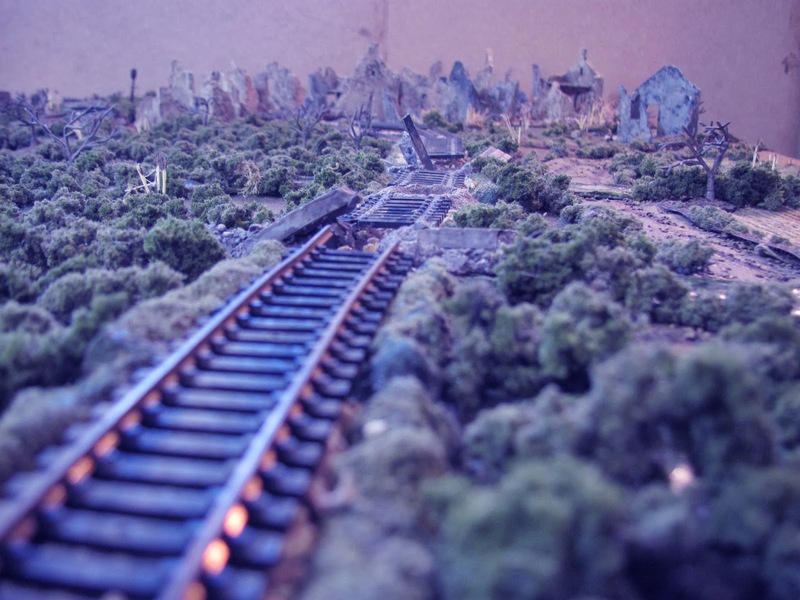 German 5 Kp., II Battalion, 361st PG Regiment, occupied the houses north of the station and the railway station itself. 6 Kp. 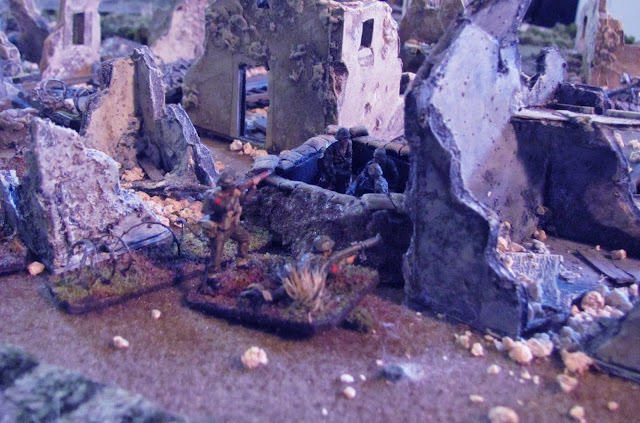 defended the railyard and hummock while 7 Kp., not in the fight, were dug in west of the Gari. This scenario covers the intitial night attack on the station. The challenge was to seize four objectives in order to secure a safe bridgehead in which the engineers could do their work repairing the German demolitions along the rail bed. 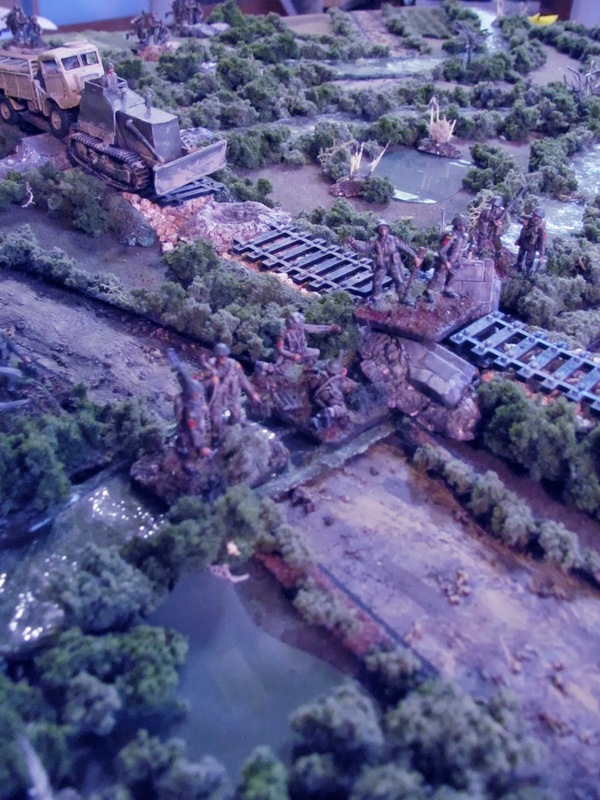 The railbed offered the only way across the water-logged ground for supporting armour and vehicles to bolster the bridgehead. It was imperative that the work be done before dawn, when German artillery would be able to once again zero in on the approach from their eagle-like vantage points on Monte Cassino. The railway runs up through the water-logged ground bordering the rapido and its tributaries. At the upper right are the outskirts of Cassino, and just below that the railway station and roundhouse. The German forces and defences west of the Gari (upper left) are placed on board but the rest are using hidden markers. Barbed wire was known but minefields, surface laid, were only discovered when the attackers were within 1”. 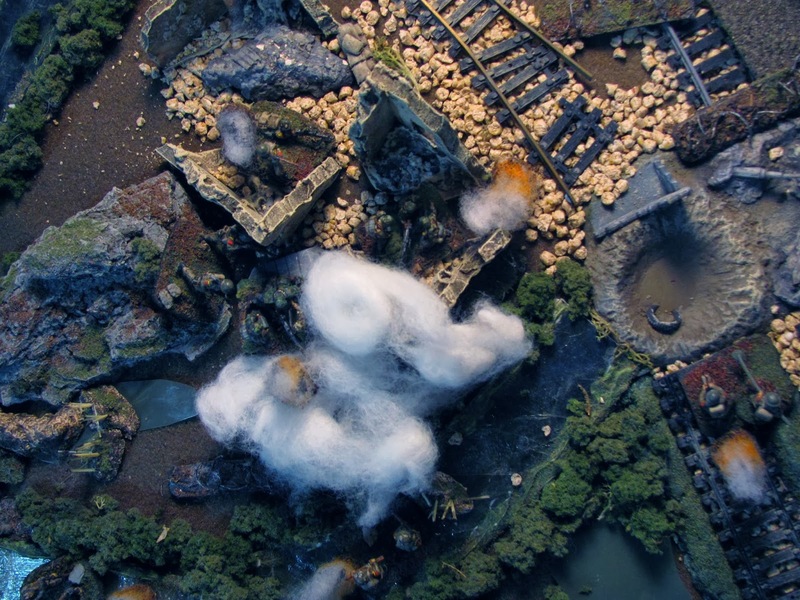 The Maoris began their attack along a sunken road, forward of where the engineers were bridging the “Little Rapido”, the first in a half dozen demolitions that had to be repaired by game's end. The first of the demolitions, the ruined bridge over the “Little Rapido”, can be seen in the foreground. Behind minefields and barbed wire 7 Kp. of the 361st Pz. 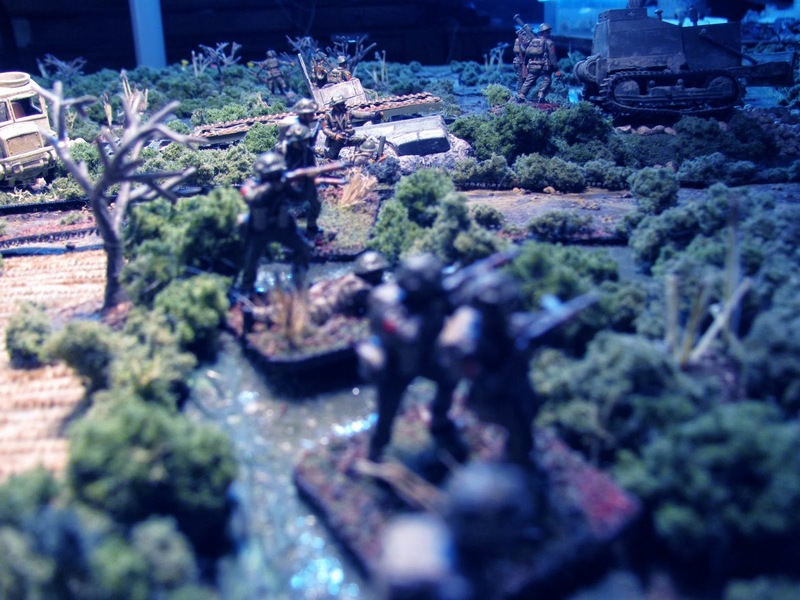 Grenadiers, II Battalion hold their portion of the Gustav Line. 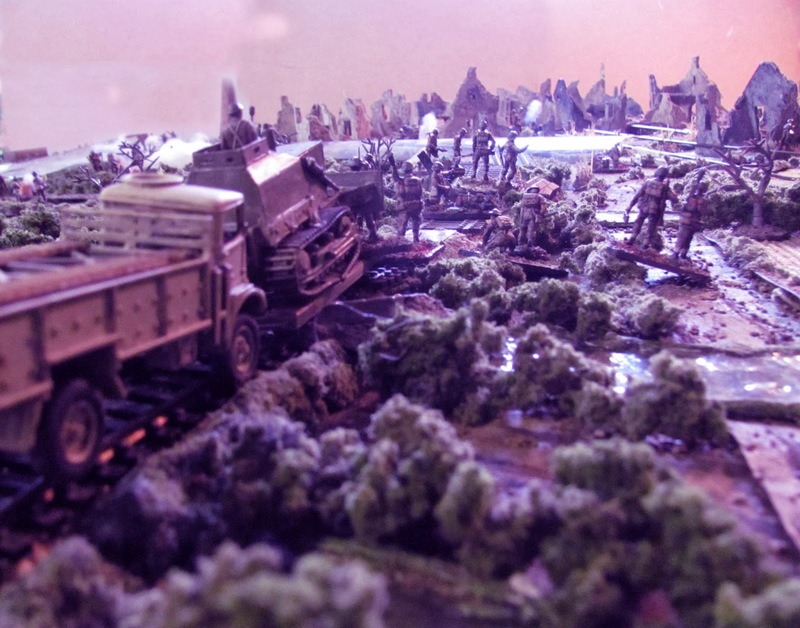 Unsure of where the attacks were going to fall, these troops have orders to stay put and not cross the Gari. As a result they willl only be involved peripherally in the night's fighting. 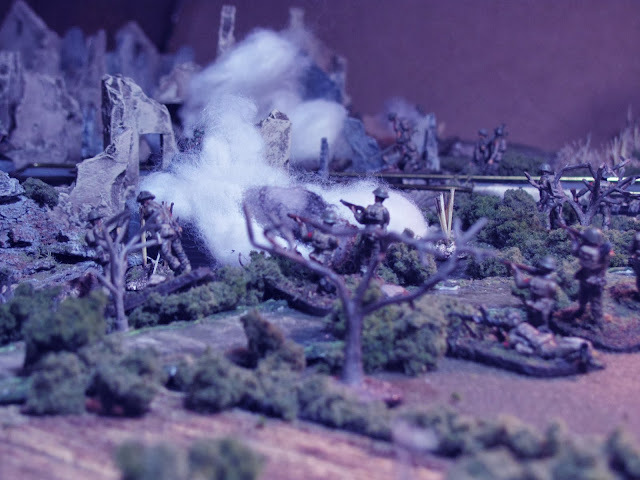 A barrage consisiting of four regiments of 25 pdrs., two regiments of mediums and a battery of American heavies opens up on the attack's objectives, pulverizing them for ten minutes before moving on to counter battery and harrassing fire. A and B Companies of the 28 (Maori) Battalion leave their start line, advancing across the sodden fields towards the railway station under cover of darkness. B Company, advancing on the houses to the right of the railway, come under fire from a German machinegun firing from a bunker. 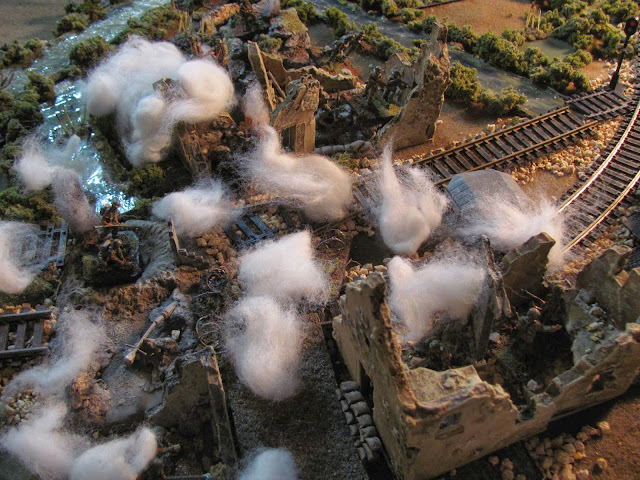 With most of the company mired in minefields and barbed wire, one section charges into the hail of bullets and knocks out the gun. An overhead shot gives a sense of the hail of bullets, tangles of barbed wire and minefields that the Maoris have to negotiate to close with the enemy. 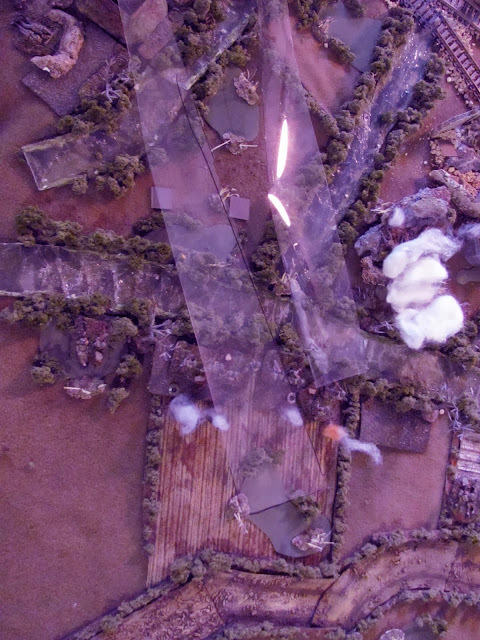 German grazing fire kept most of B Company's heads down, but one lone section managed to dash through. 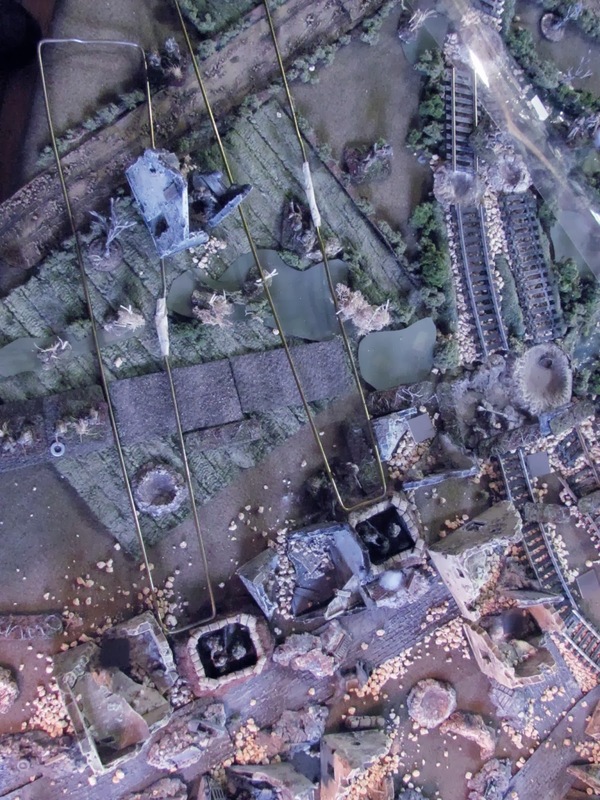 Gerrman artillery, targetting behind the minefields, has already caused a few casulaties even before the Maoris have made contact.Railway station is at bottom right. A Company, attempting to outflank the machinegun fire they are taking from the hummock south of the roundhouse, encouter minefields and are pinned by more machinegun fire coming from the German positions west of the Gari River. 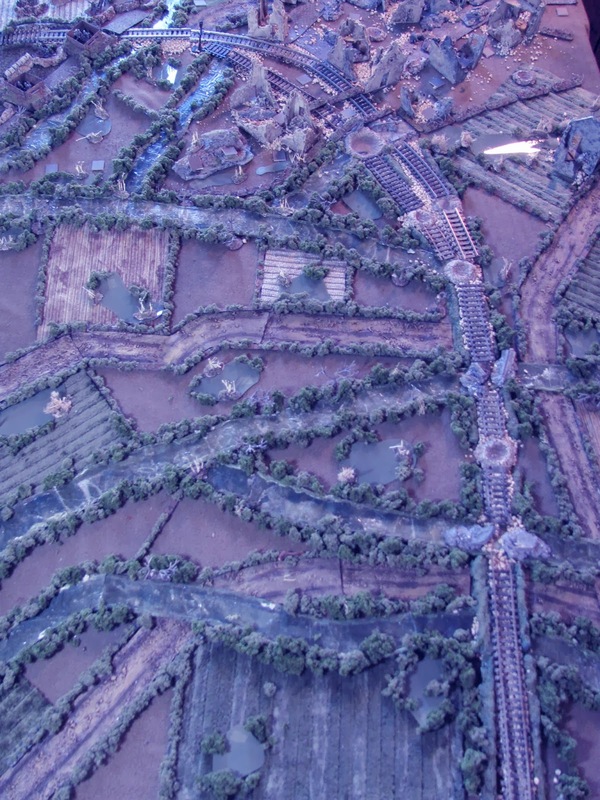 Although the minefields are dummy fields, the machinegun fire ie enough to cause them to abandon this approach. 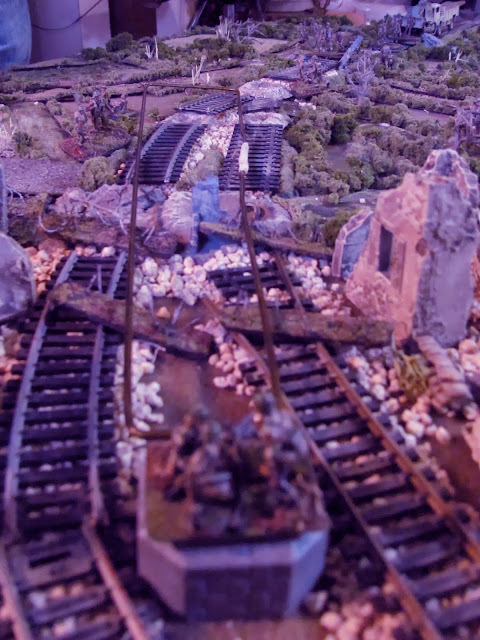 Meanwhile the engineers are working feverishly to repair the German demolitions along the railbed. This work is imperative as the railway is the only approach possible for A Squadron of the 19th Armoured Regiment to advance its Shermans. The Little Rapido is quickly bridged and the engineers move forward to begin manual work on the subsequent demolitions. The bulldozer of the Mechanical Equipment Platoon crosses the newly constructed bridge while a truck full of bridging supplies for the main work over the Rapido waits to move forward. 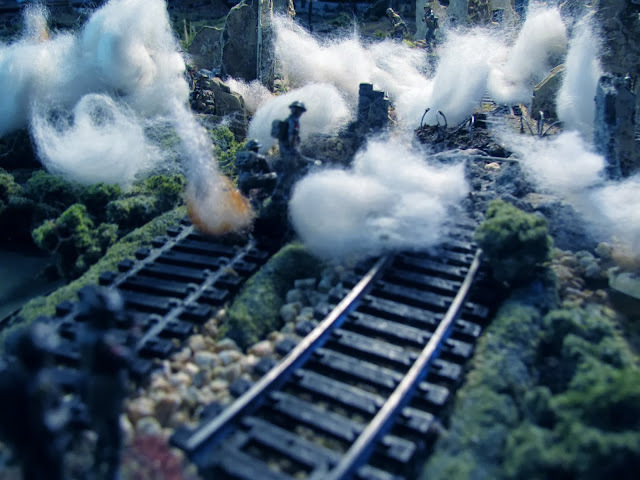 As some of the lead engineers, working ahead, approach the fifth and sixth demolitions, yet another German machinegun opens up from a bunker in the railyard, sending a torrent of bullets straight down the railway and driving the engineers from their work. 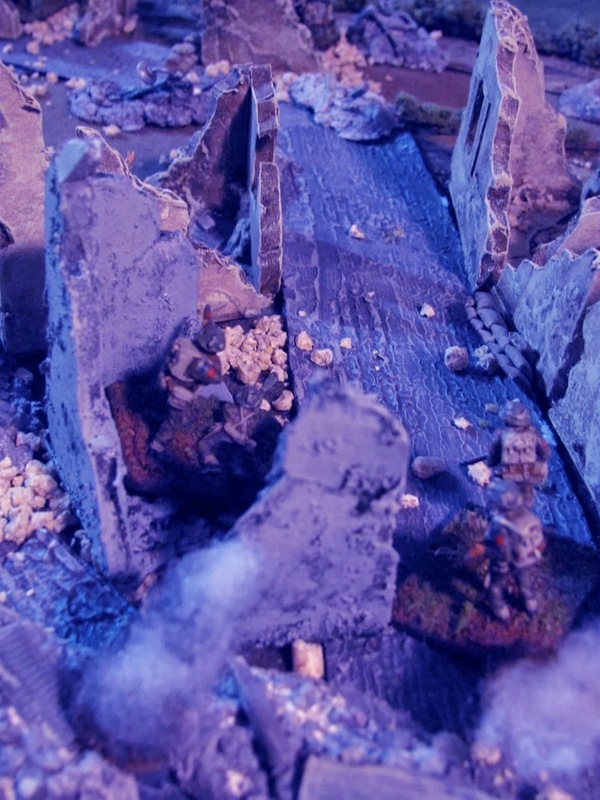 Having reached the outer most houses, some of B Company begin to work their way north, engaging in close combat the second of the two machineguns that are holding up the attack on this flank. At the bottom right B Company can be seen starting to make some headway against the Germans in this sector. 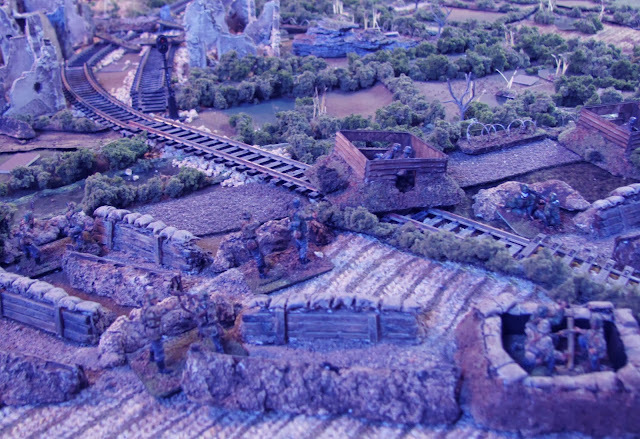 South of the railway (top right) German efenders still hold out stubbornly in the roundhouse, but no longer hold the hummock. 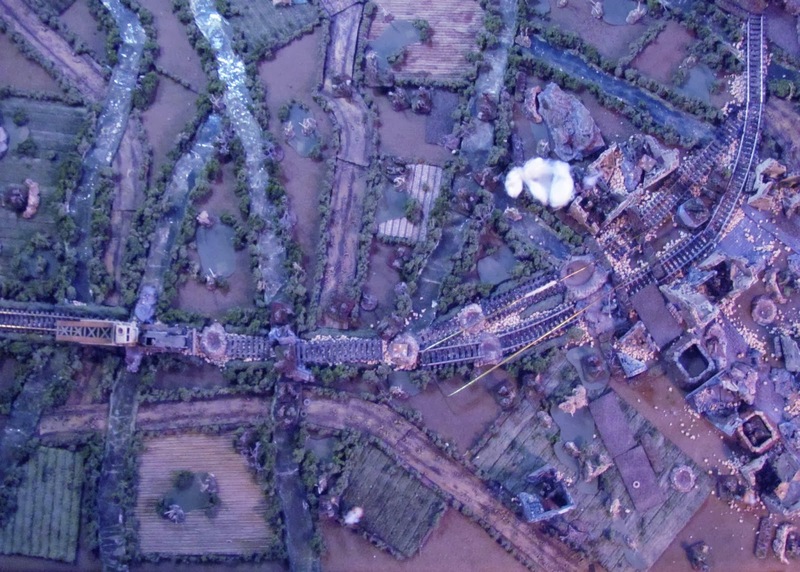 However, A Company is stalled out in the water-logged area to the left of the station and unable to make headway. Meanwhile the engineers begin work on the Rapido crossing but are hampered by the lack of bridging equipment, still held up further down the line as the bulldozer fills in the second demolition, a blown gap in the railbed. 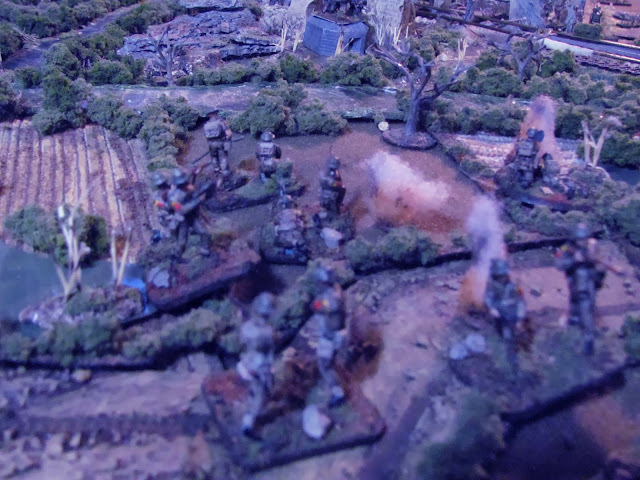 The second German heavy machinegun is taken out of action and the Maoris of B Company begin to close in on the final German positions on this flank. The bridging supplies necessary to complete the first span of work over the Rapido are held up until the bulldozer can fill a gap in the railbed. On the NZ left flank A Company comes under heavy mortar and machinegun fire as they go to ground in front of the roundhouse and hummock. Having finally forcd their way into the cassino outskirts, B Company begins to attack back towards their first objective, the intersection northwest of the railyard. With bridging supplies and the bulldozer having finally arrived work begins in earnest on bridging the Rapido. This is the largest of the demolitions that will have to be repaired, requiring the work of an entire platoon of engineers and two truckloads of supplies. Although others are wrorking ahead of the Rapido as much as possible on demolitions 4 to 6, the engineers are beginning to run seriously behind schedule as time starts to run out. With off board artillery once more becoming available, the mediums stonk the railyard with a thickened concentration that wreaks havoc among the German defenders. Under cover of smoke A Company tries to revive its stalled attack as the battalion mortars drop shell after shell on the stubborn machinegun post that has been holding them at bay south of the roundhouse. The first attempt to take the roundhouse fails as Grman defenders drive off elements of A Company that have attacked from the left flank. Meanwhile, on the right flank, B Company, having suffered losses of 50% suddenly break off their attack on the intersection and retreat towards their start line. It is an unfortunate turn of events for the Maoris as the German defence had all but collapsed in this sector as they retreated to the railyard, but the uncertainties and loss of command and control as a result of darkness (and bad die rolls) lead to this most untimely of withdrawals! 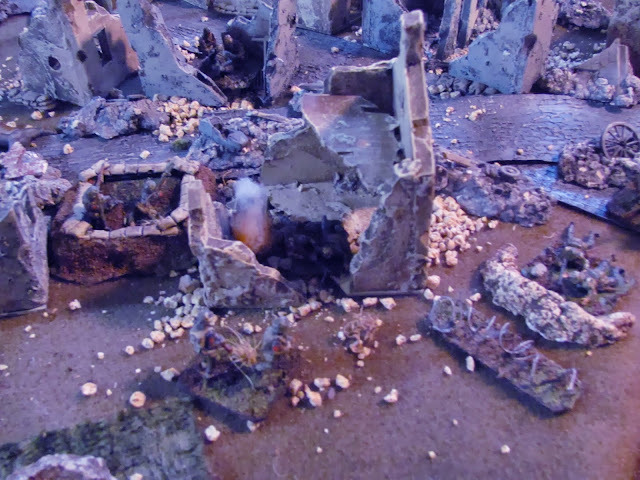 With the railway station and roundhouse still in German control, the engineers are forced to work on the final demolitions while under mortar and machinegun fire. 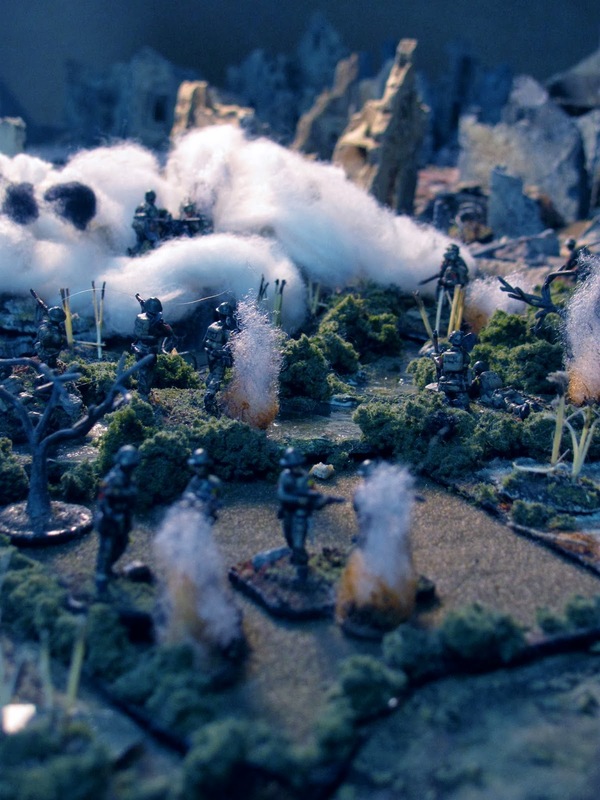 Casualties among 8 Field Company begin to mount. A second attempt at the roundhouse finally clears it in a series of close assaults. Although the work on the Rapido moves ahead slowly, all other demolitions are repaired other than those at the entrance to the railyard. The engineers work under cover of smoke, but the moon has now come out and the Germans know thy are there, and mortar fire continuously disrupts the work. 23. Rapido finally bridged – but too late! 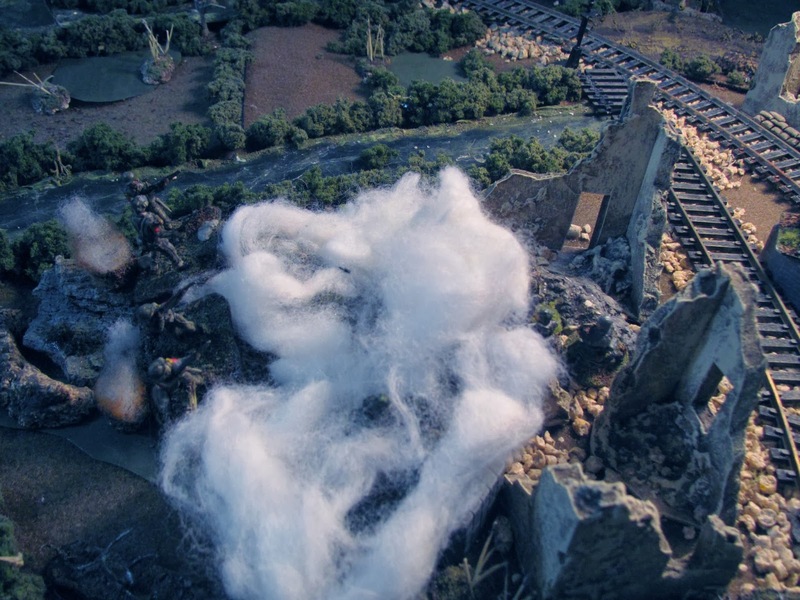 The Rapido is finally bridges and the bulldozer and engineers engaged in this task begin to move forward, but it is too late. Dawn is almost here and the last demolition is yet to have been repaired. With the Maoris of A Company closing in on the railyard, German 6 Kp. breaks and runs, fleeing past an antitank gun waiting west of the yard as assurance against the arrival of enemy armour. B Company's flight from Cassino finally comes to an end as they reach their start line. They manage to regroup but it is too late for them to re-enter the battle. 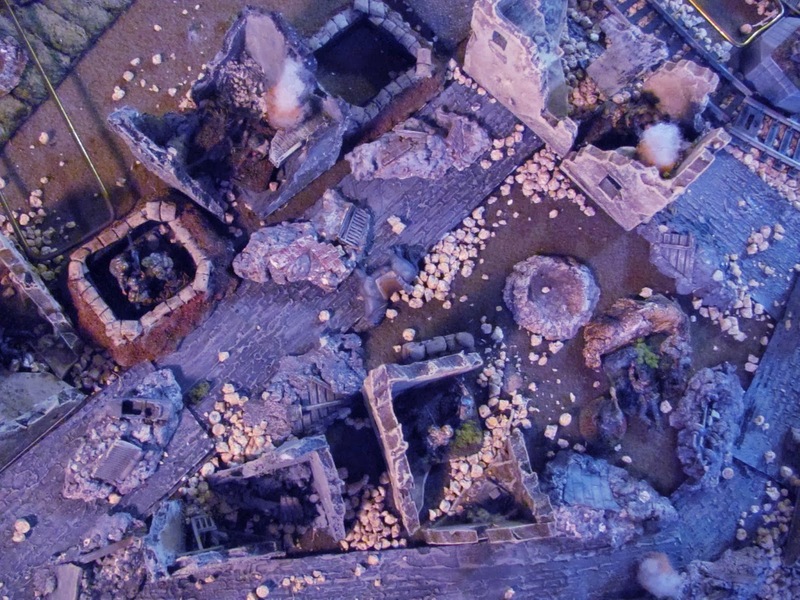 As A Company finally drives the last of the defenders out of the roundhouse the sun breaks on the horizon. Elements of 5 Kp. still hold out tenaciously in the railway station, denying the New Zealanders of any hopse of holding their bridgehead. 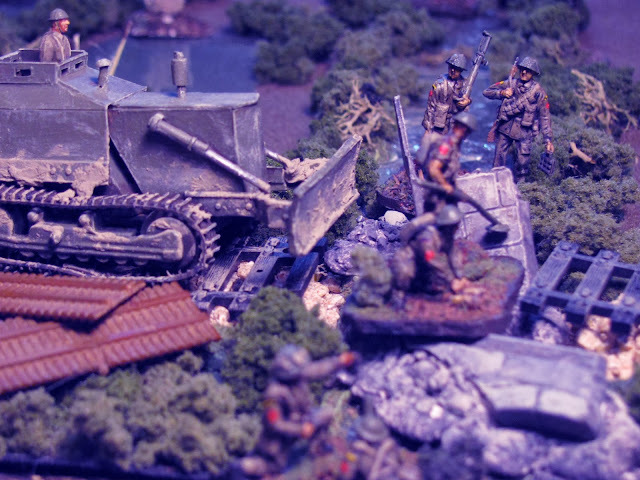 The engineers, working on the final demolition, are forced to withdraw before completing the work and the tanks of A Squadron wait well east of the Rapido with no way forward. With only two of the four objectives taken by the Maoris, and the railway station still in enemy hands, there will be no opportunity to win this battle and the night goes to the Germans as a marginal victory.